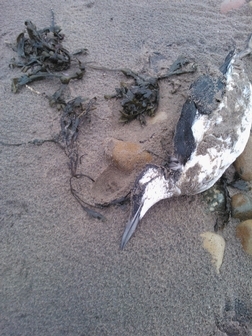 During February 2014 there were many reports of dead birds, mainly Razorbill and Guillemot, on Arran’s shore. These birds had virtually no flesh on them and had starved to death. 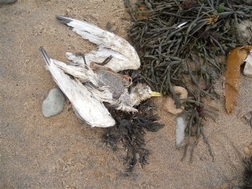 In February there is the annual systematic count of these dead shore birds called the “Beached Bird Survey”. It is part of a European wide survey and here on Arran twenty volunteers from the Arran Natural History Society walked the shores counting and identifying dead birds around the weekend of 22/23 February 2014. 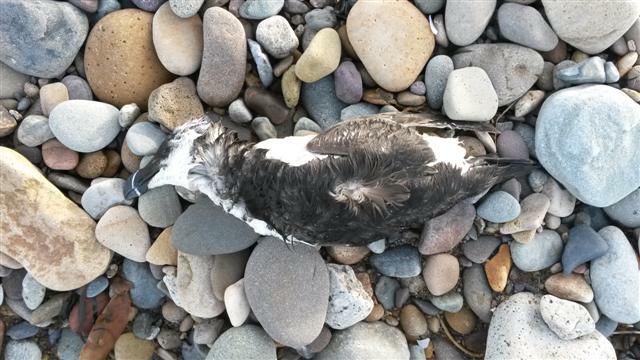 Last February, around six hundred and fifty volunteers walked 2,120 kilometres of beaches around the UK and found a total of three hundred and seventy-five dead seabirds. This works out at around 0.18 dead seabirds per kilometre, the fourth lowest figure since 1991. The UK figure in the last twenty odd years has ranged from 0.14 to 3.80. Arran matched this figure last year with 0.15 dead bodies per kilometre. By contrast this year on Arran the figure was more than twenty times larger. The twenty Arran volunteers walked almost seventy kilometres of beaches and found a total of 281 dead seabirds. This works out at over four dead seabirds per kilometre. By far the largest group were Razorbill, being eighty percent of the bodies found. The next two largest groups were Guillemot at eight percent and gulls at seven percent. Many of the Razorbills were young inexperienced birds. These birds seemed to have died of exhaustion or starvation as a result of days of gale-force winds, which made it impossible for them to fish. Four of the Razorbills had a ring on their leg. The data has been sent off to Euring and hopefully background information including where these birds were ringed will be provided. It may be some time before all the results for the UK are collated and the full picture emerges but from figures released from France the violent storms that have battered Europe’s western seaboard this winter are to blame for the deaths of thousands of birds there. Indeed a total of 21,341 dead birds were found in western France by 500 volunteers working over three weekends, the French League for the Protection of Birds said in a recent statement. The worst affected species were Puffins, Guillemots and Razorbills.